Style Geek: [OOTD] For Who Could Ever Love a Lumberjack? 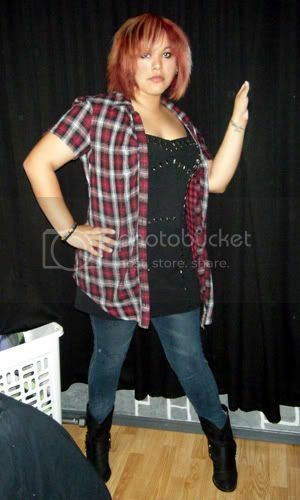 The mix of jeans, plaid and boots brought unwanted yet funny memories of my ex. She was tall, strong, and a little thick. My BFF's husband called her "Lumberjack". It made me angry but I pretended to shrug it off. I guess now it doesn't matter, but I wonder if they where disrespecting our relationship. Has that ever happened to anyone? Alex, on the other, hand gets disrespect from my mom who still can't accept that I'm a lesbian. But that's been ongoing. If it's family, does that make it ok? BTW that dungeon in the background is Alex's room. She painted it herself. My first reaction was, "WTF? That takes more patience than I will have in a lifetime!" But she occasionally says something similar when I do my web design. And somewhere in this mix of memories and musings, I'd like to add that I will be giving away a special bracelet later tonight. It will have it's own post explaining why it's special.